Ghost Recon FAQ - Can we play GRAW 2 after Gamespy shutdown (Online)? Can we play GRAW 2 after Gamespy shutdown (Online)? In the summer of 2014 Gamespy shut down their game servers, affecting many games. As GRAW2 uses Gamespy for account login, fans were left wondering if they could still play GRAW 2, either offline to play missions and mods, or online to play matches with other GRAW2 players. The good news is YES you can still play GRAW2, so if you are recieving a server error when trying to play GRAW 2 here is how you should proceed for ONLINE games. 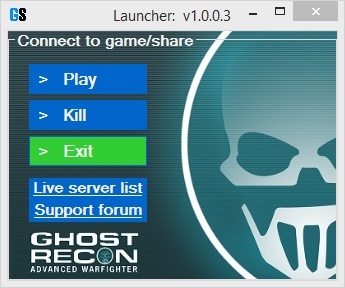 If you want to play offline by yourself, please see our seperate entry for playing Ghost Recon Advanced Warfighter 2 offline after the Gamespy shutdown. This guide applies to both Steam and boxed retail versions! Late in 2014 Gameshare coded a small app that bypasses the need for a Gamespy account to play GRAW2 online. IT does this without changing any game files, simply by adding a few lines to your windows hosts file. This is a windows system file that allows users to re-direct internet traffic. In this manner Gameshare redirects the GRAW2 gamespy request to the Gameshare.co servers, where the request handles the login procedsure instead of the defunct gamespy. This is a legitmate process prepared with the assistance of Ubisoft. All that is required is to download the GRAW 2 Launcher, and run it. Once the programme has been launched it will ask you to direct it to the graw2.exe file. If you are using Steam GRAW2 this will be in your steamapps folder. The launcher will then start GRAW2 and you should click the Create Login button and then type in your preferred username and a new password. You may have to do this step twice for it to take effect. Once you have done this you should see a list of multiplayer servers in the Multiplayer menu. If you need further support please post in our forum topic Playing GRAW2 after Gamespy shutdown. How Many Missions are in Ghost Recon? Cannot install Ageia, Error is "Fatal Error Installation ended prematurely because of an error." How can I play GRAW 2 on Windows 2000 (W2K)? Game crashes with a direct X error about textures. How do I set up a Xbox 360 controller to work with GRAW2? Can we play GRAW 2 after Gamespy shutdown (Offline)?